Carlton McCoy, sommelier for Sou'Wester. Photo courtesy Pfau Communications. Ah, the mystique of the sommelier. How many times have you actually felt comfortable engaging in that dance of the wine list with one? There’s the delicate waltz about price point, the fear of disapproval of your favorite varietal. Unless you are a wine connoisseur or see something you recognize, no doubt it’s been awkward at best. Enter Carlton McCoy, native Washingtonian and sommelier for Sou’Wester, Chef Eric Ziebold’s second restaurant at the Mandarin Oriental. Or rather, enter-exit-enter-exit-here-there-everywhere Carlton McCoy. I’ve never seen a sommelier with this kind of high energy. Almost like that perfect host at a private dinner party, checking in guests, smiling and milling about in an friendly open manner – he completely demystifies the role. Gone are the days when people will accept a raised eyebrow reaction to a request for a moderately priced bottle. As we learn more about wine, we are less likely to approach a sommelier like a high priest, and certainly in rough economic weather that’s less likely to be tolerated. The best ones understand this and want to share their passion in an approachable manner. Carlton has this quality, times ten. I would never hesitate to ask him anything about wine, and I know he’d give an honest, no-nonsense reply. This refreshing attitude comes backed with a pretty impressive pedigree. He’s an Advanced Level Sommelier from the Court of Master Sommeliers (that’s one level away from being a Master Sommelier, of which there are only 168 in the world). But Carlton began his career in the culinary world, attending the Culinary Institute of America with stints at famed New York restaurants Aquavit and Per Se. He returned to DC to be Chef Ziebold’s assistant sommelier at CityZen while also managing the cheese cart there. His official duties at Sou’Wester include managing the some 250 bottle wine list, all-American beer list and cocktail menu. Having worn many different hats suits his expansive style well. Carlton is passionate about allowing Sou’Wester’s beverage program to develop organically over time. Take the bar – it doesn’t actually exist yet! Currently there’s just a “sun porch” with a long banquette and rocking chairs, facing an outdoor flagstone patio. A true bar is in the works for this area with a projected roll-out in the spring. As a SW resident, Carlton knows the neighborhood has a dearth of hang-outs and is hopeful this could bring something much-needed to his fellow Southwesters. To do this, he needs to get people to push past the “Mandarin” factor – which let’s face it, is viewed as a bit posh for a laid-back bar. Solution? 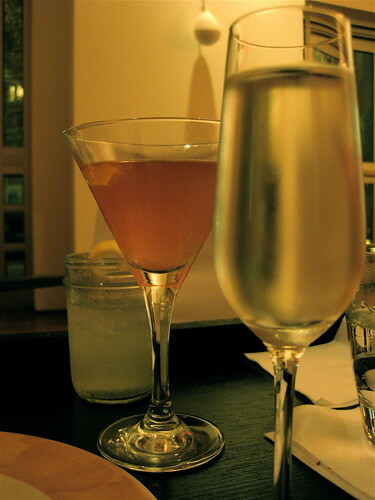 A beverage program that’s unintimidating, with a lower price point than neighboring CityZen. To build it was a real challenge – which he matched by using wineries recognizable to the moderately knowledgeable, such as Acacia and Trimbach, while also introducing lesser-known varietals like moscato d’asti for those ready to expand their tastes. There’s a relaxed happy hour billed “Country Time” and an approachable beer list. The program has to skate the lines between budget and luxury depending on season and situation. These are challenges that may strike some as mundane or unexciting, but Carlton’s passionate defense of the pummeling Sou’Wester got by a certain local critic reminds you that it isn’t all glamour in the industry. “I went into Chef’s office as he was reading the review, he put it down and said – ok, what can we learn from this?” It’s a great attitude and reminder that not all openings are smooth. It’s a hard industry after all, and it’s worth noting that there are real people behind your food and drinks. 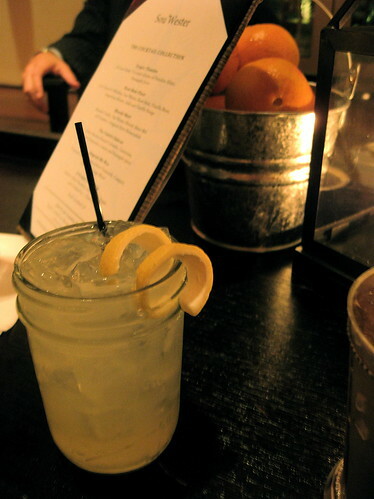 My favorite was the aptly named “When Life Gives You Lemons” featuring limoncello, lavender syrup, lemon juice, and soda water. As a huge fan of herbal drinks, I appreciated the strong note of lavender. Fans of mimic drinks will enjoy the root beer float with just the right amount of bitters to keep it from being too sweet. But he’s most proud of “A Bronx Tale” (named after his favorite movie) with Aviation gin, Dolin Blanc vermouth, Grand Marnier, and rhubarb-orange syrup. For a first attempt, these are all lovingly presented and nicely balanced – not too complex, they are excellent entry cocktails for those not already immersed in the hand-crafted revival. Sou’Wester is located in an area poised for explosion, with a beautiful view of the waterfront. The whole venture strikes me as a gamble, as to get locals here you have to offer something special. But Carlton’s well up to the challenge. I think he actually relishes it. And if you’ve been holding back from talking in depth to a sommelier and learning more, he’s your man. Many thanks to Carlton McCoy for letting me sample his beverage program for the third We Love Drinks profile feature, and to Sangeetha Sarma for making the introduction. Carlton is a shining example of what the non-profit organization C-CAP (Careers through Culinary Arts Program can do to help underserved high school youth find careers in the foodservice and hospitality industry. Carlton, as a senior in high school won a full-tuition scholarship from us to attend the CIA. 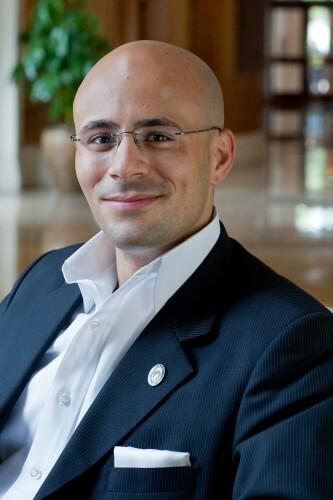 We helped him get an internship at the Four Seasons Hotel in Georgetown and have followed his career closely ever since. Carlton,as you have noted, is an exceptional young man with an outstanding future ahead of him. We hope that you will continue to focus on him in the years to come.